Freezer Meal Honey Teriyaki Chicken - chicken, honey teriyaki sauce, garlic, basil, rosemary, chicken broth and brown sugar - throw everything in a freezer bag and freeze until ready to cook. Can cook frozen. SO easy and super delicious. Serve over rice for a complete meal! This is the first in a series of 10 freezer meals that I am going to be sharing with you this month. I know a lot of kids are heading back to school, and everyone needs a little help with dinner. These freezer meals are easy to assemble and even easier to make. Just throw the frozen food into the slow cooker on your way out the door and dinner is ready when you get home! 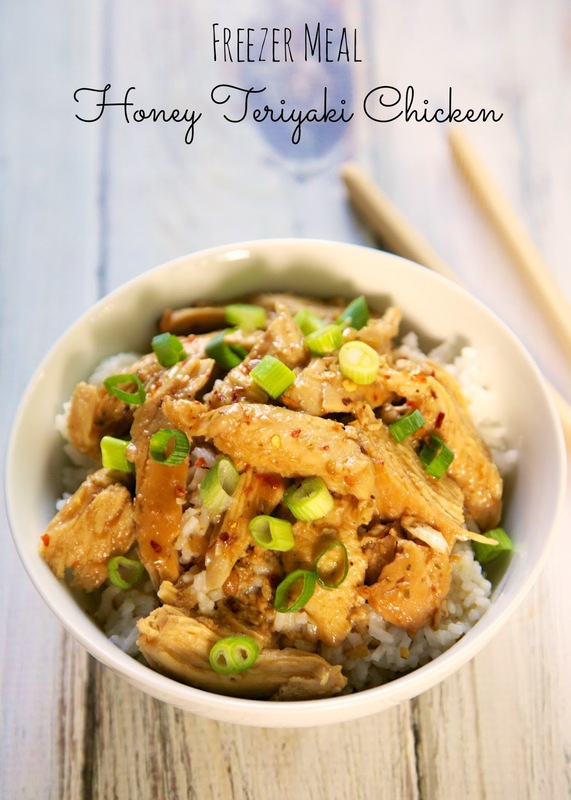 This Honey Teriyaki Chicken was delicious. We both loved it, and I don't even care for Asian food. 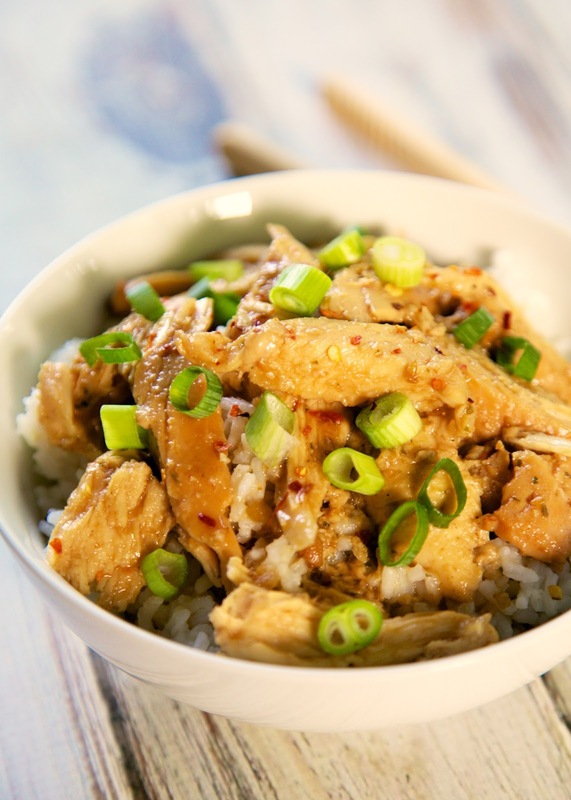 We served the chicken over some rice and topped it with a shake of red pepper flakes and some green onions. It was delicious! We ate this leftover for lunch as well. It was equally delicious! Thank you so much for doing this! I'm also super excited about this series as I am returning back to teaching after taking a few years off to stay home with my babies. Looking for something that is super easy to make for dinner and think freezer cooking is my solution! Can't wait to see what else you come up with- I know it will be delish!! Love how you include the freezing and cooking/reheating directions- that is the part that confuses me the most! Hi Steph, would you mind sharing what brand Honey Teriyaki Sauce you used? Thanks and I really look forward to this series!! Kelli - Ken's, KC Masterpiece or Kikkoman's work great. Thanks!!! Looking forward to making this one! I've just started doing freezer meals and will be doing my second round this weekend! I can't wait to see what meals you will be posting! It has saved so much time! Just so I understand correctly: the chicken is not cooked when you freeze it, correct? I could not find honey teriyaki sauce today and was going to make all 10 of these up tonight. I have teriyaki sauce and I have honey. Can I improvise? I have honey and I have teriyaki sauce. Can I improvise, since I cannot find honey teriyaki anywhere in my town? Sure - just reduce the teriyaki by the amount of honey you use. I would probably use 2 or 3 Tbsp of honey - just depends on how sweet you want it. Enjoy! If I split the recipe in half would that reduce the cooking time? As a family of 5 with 3 small kids we certainly do not need 8 servings but splitting it up over 2 meals would work perfectly. The cooking time would be about the same - it might be ready closer to 4 or 5 hours, but it could go for 6. Are you cooking the chicken for 6 hours from frozen or are you defrosting first? Can you cook this first, then freeze the leftovers?